It’s Sunday! At our house that means family Sunday dinner and you can’t just have dinner, you have to have dessert too! Coconut was never a ingredient that I would use in my cooking but that has changed. My husband used to say, he wouldn’t eat anything that had coconut in it but then our Andie came along and changed everything! 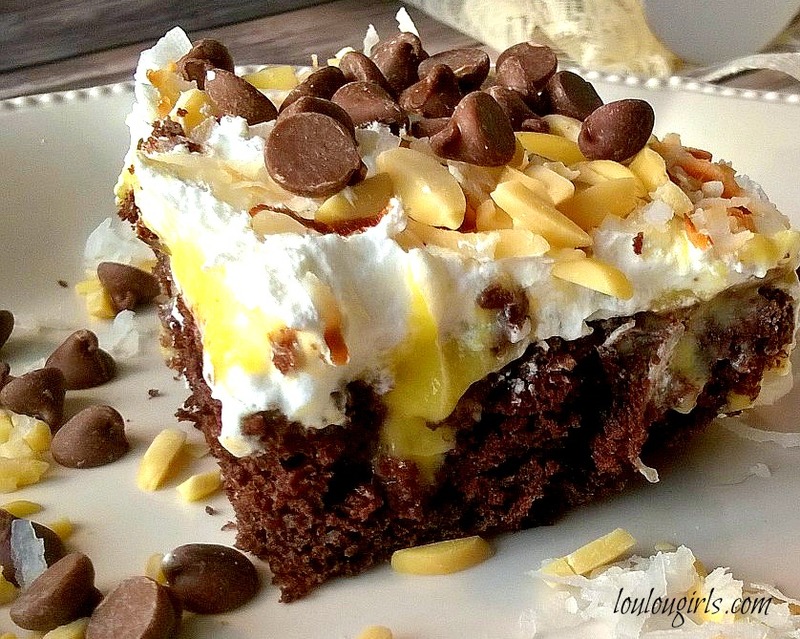 This cake is sinfully delicious and you won’t be sorry that you made it. In fact, you might receive a medal from your family! 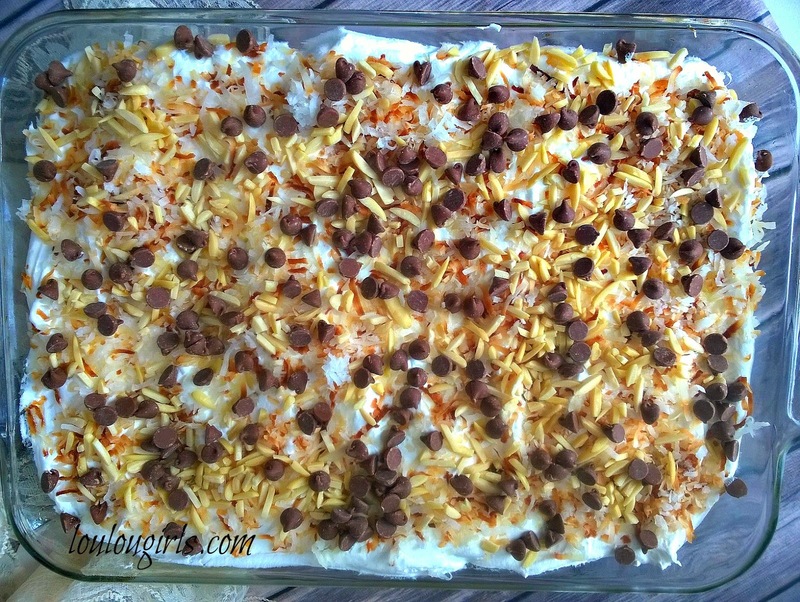 Super easy to make and it will become one of your go to recipes! Preheat oven to 350 degrees, and spray 9 x 13 pan with cooking spray. In a bowl, combine cake mix, coconut milk, egg, water, and vanilla with mixer. Mix well. Pour the batter into the baking pan. Bake as directed on cake mix box. Remove cake from oven and allow to cool. Once it’s cool, make holes in cake with a wooden spoon handle, about a 1/2 inch apart. In a bowl, whisk together the pudding mix, milk and coconut extract together. Mix until it begins to thicken and quickly pour into the hole in the cake. Spread top of the cake with Cool Whip. 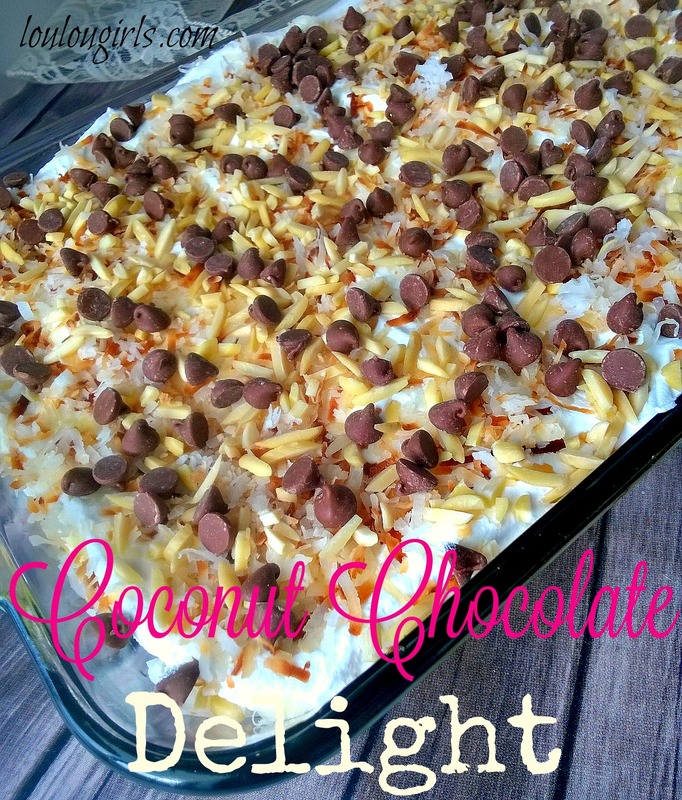 Sprinkle with the toasted coconut, almonds and chocolate chips. Place in the refrigerator for at least 2 hours to set up.